With a little help from Domtar and our PaperPal™ program, elementary school students and law enforcement officers in Rock Hill, South Carolina, learned about each other through handwritten letters about sports, pets and more. Recently, Olde Pointe Elementary School hosted a breakfast so the PaperPals could meet in person. The event was a hit with students and officers alike, and it highlighted the many benefits of handwriting and relationship-building. The PaperPal program brings generations together through handwritten letters. It began in 2015 with a school and retirement community in Van Nuys, California. The idea, chronicled in a short video, was so successful that the PaperPals wanted to continue sending handwritten letters to each other even after the initial two-month program officially ended. Students in Montreal and Kamloops, British Columbia, also have enjoyed the program by pairing with local senior citizen homes. In Rock Hill, officers from the York County Sheriff’s Office and Rock Hill Police Department exchanged letters with the fifth-grade students for six months before meeting at the breakfast. A letter written from a law enforcement officer to a fifth-grader at Old Pointe Elementary School. Research shows that handwriting has neurological benefits for the developing minds of young children, and it is an effective way to communicate on a more emotional level. “The PaperPal program was a great way for our officers to meet students on a personal level and let them know that we care and we’re here to protect them,” says Sheriff Kevin R. Tolson of the York County Sheriff’s Office. 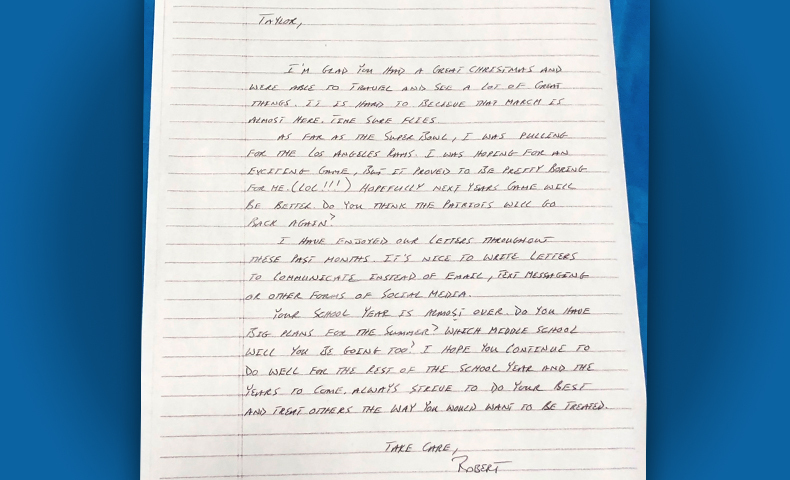 Tolson exchanged handwritten letters with a student named Rebecca and met her for the first time at the event. The moment was captured on video and featured on the local news station. Our Rock Hill converting plant, which employs about 50 people locally, sponsored the program. “Besides the educational and cognitive benefits of PaperPal, we are excited to see how this program sparks smiles and hugs for both children and adults,” says Michelle Osborne, administrative coordinator at our Rock Hill facility. 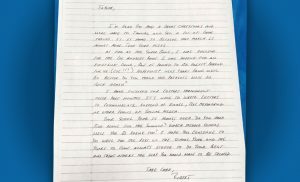 Osborne led the effort to connect students and law enforcement officers through handwritten letters. See more Olde Pointe Elementary School students meet their PaperPals after six months of exchanging handwritten letters.